The QTapReading class represents one reading from the tap sensor. The tap sensor registers tap events along the 3 axes that originate from the phone. The axes are arranged as follows. By default it returns only double tap events. The QTapSensor::returnDoubleTapEvents property must be set to false to return individual tap events. The tap direction is indicated using flags. Applications should check for the presence of a particular flag as multiple flags may be set at once. 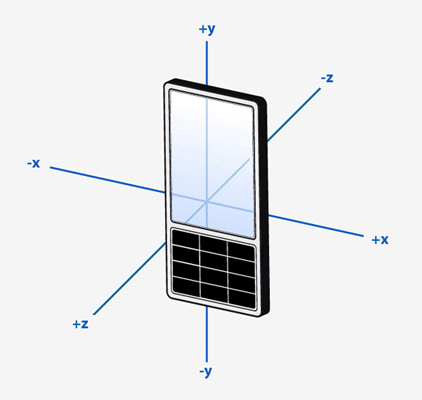 The X, Y and Z flags allow an app to check for taps along an axis without caring about the direction. The *_Pos and *_Neg flags allow checking for taps in a specific direction. Note that some devices cannot determine the direction of a tap and will set both the _Pos and _Neg flag for the detected axis. Previous versions of the API did not allow this. Applications that check for the _Pos and _Neg flags as values should be updated so they can work with all devices. QTapReading::Undefined 0 This value means that the direction is unknown. QTapReading::X 0x0001 This flag is set if the tap was along the X axis. QTapReading::Y 0x0002 This flag is set if the tap was along the Y axis. QTapReading::Z 0x0004 This flag is set if the tap was along the Z axis. QTapReading::X_Pos 0x0011 This flag is set if the tap was towards the positive X direction. QTapReading::Y_Pos 0x0022 This flag is set if the tap was towards the positive Y direction. QTapReading::Z_Pos 0x0044 This flag is set if the tap was towards the positive Z direction. QTapReading::X_Neg 0x0101 This flag is set if the tap was towards the negative X direction. QTapReading::Y_Neg 0x0202 This flag is set if the tap was towards the negative Y direction. QTapReading::Z_Neg 0x0404 This flag is set if the tap was towards the negative Z direction. QTapReading::X_Both 0x0111 Equivalent to X_Pos|X_Neg. Returned by devices that cannot detect the direction of a tap. QTapReading::Y_Both 0x0222 Equivalent to Y_Pos|Y_Neg. Returned by devices that cannot detect the direction of a tap. QTapReading::Z_Both 0x0444 Equivalent to Z_Pos|Z_Neg. Returned by devices that cannot detect the direction of a tap. This property holds a value indicating if there was a single or double tap. This property holds the direction of the tap. Sets the double tap status of the reading to doubleTap. Sets the tap direction to tapDirection.